Ralph Jones was special. Newspaper editor Ralph McGill thought so, and so did President Roosevelt. Editor of the Atlanta Constitution Ralph McGill wrote of a ceremony he attended honoring thirty one young men from North Georgia College who were organized and lead by Ralph Jones to enlist en masse in the U.S. Naval Air Corps. Born into a large and loving Griffin family, Ralph Jones nevertheless stood out from the start. As a child he earned the nickname that followed him all his life. In a pick up football game a skid on his rear ignited matches in his pocket and set fire to his pants. From then on he was “Smokey” to all who knew him. Early on Ralph and his family had a brush with at least local fame. Through support for Mr. Roosevelt early in his career, Mr. and Mrs. Jones were friendly with the President and were often invited to play cards when he was at Warm Springs. Ralph and his brother Walter naturally tagged along. On one occasion Ralph startled Secret Service men when he spontaneously jumped on the running board of the President’s car. As they lunged to grab him, Mr. Roosevelt said “No. No. He’s with me.” Together they rode away – Ralph and the President. A better than average student at Fourth Ward Grammar School and Griffin High, Ralph probably enjoyed his extracurricular activities more than the classroom. Known for his boyish good looks, Ralph was popular with his classmates and teachers, active in school organizations and social life and a star on the football team. However he may have been even better known for his name sake concoction invented while working after school as a soda jerk. The “Jones Special” was so popular around town that other soda fountains – where he never worked – copied it and adopted the name. 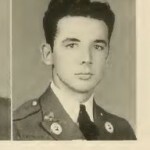 After high school Ralph enrolled at North Georgia College where he served, among other things, as sports editor of the school annual, YMCA – Secretary/Treasurer and Pan Hellenic Council – Secretary/Treasurer. But his college years were, if not cut short, completed under a cloud. War broke out in December 1941 . Determined to do what he could for the war effort Ralph persuaded thirty one of his school mates to join up together and accordingly they selected him their squadron leader. 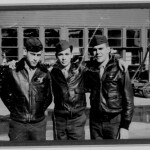 Immediately on graduation in June 1942 they all enlisted as the “Hell’s Angels Squadron” and served together for the most part throughout the war. In the service Ralph trained as a Marine Corps pilot flying B-25D Mitchell Bombers and was soon assigned to duty in the Pacific Theater. Though he promised his family he “would keep his head down and never volunteer for anything” after fifteen combat missions, which qualified him for time off to “rest and recuperate”, he continued to fly. On his nineteenth mission, May 5, 1944, Ralph was co-pilot on a bombing run against an enemy supply area on Japanese held Rabaul, New Britain when his plane was hit by antiaircraft fire and lost an engine causing it to crash almost immediately into the jungle. It disintegrated on impact. All seven men on board were killed. It was not until 1949 that the site of the crash was found but very little of the plane and it’s crewmen could be recovered. What remains were found could not be properly identified and were buried in a common grave at Arlington Cemetery. There the matter rested until 1999 when land being cleared to plant crops revealed what was subsequently identified as Ralph’s B25 bomber. As it does in all similar cases the U.S. Government initiated a very extensive investigation using DNA analysis, bone fragments, dental and military records and conclusively Identified the remains as Ralph Jones. At the request of the family, fifty eight years after he gave his life for his country, 1st Lieutenant Ralph M. Jones’s ashes were returned home and buried with full military honors in his family plot in Oak Hill cemetery. “Greater love hath no man than this that he lay down his life for his friends.” Ralph Jones’s Mother sat beneath that plaque every Sunday without fail until her death. It does indeed, thanks to young men like “Smokey” Jones.